Happy New Year to all my wonderful blog followers and readers. I hope 2016 brings you wonderful things. I would like to say that it has already brought me some wonderful reading material!! I have lots of great reviews coming up this year, and to begin with it’s in the form of Eric Appleby! Zero to Hero. Written by Dan Worsley and illustrated by Martin Spore. So, down to business … the book! Through reading Eric Appleby! Zero to Hero, I am now a proud member of Team Eric, and as such I’m unable to reveal the full details of the story. But I’m not really into plot spoilers at Book Monsters anyway, so this shouldn’t be too tricky. We all know or maybe even have been once, that one loner at school, the child who sits on the outskirts of it all, on their own at playtime, quiet, maybe lacking confidence and self belief. Well, if you do or don’t know that child – it is Eric. 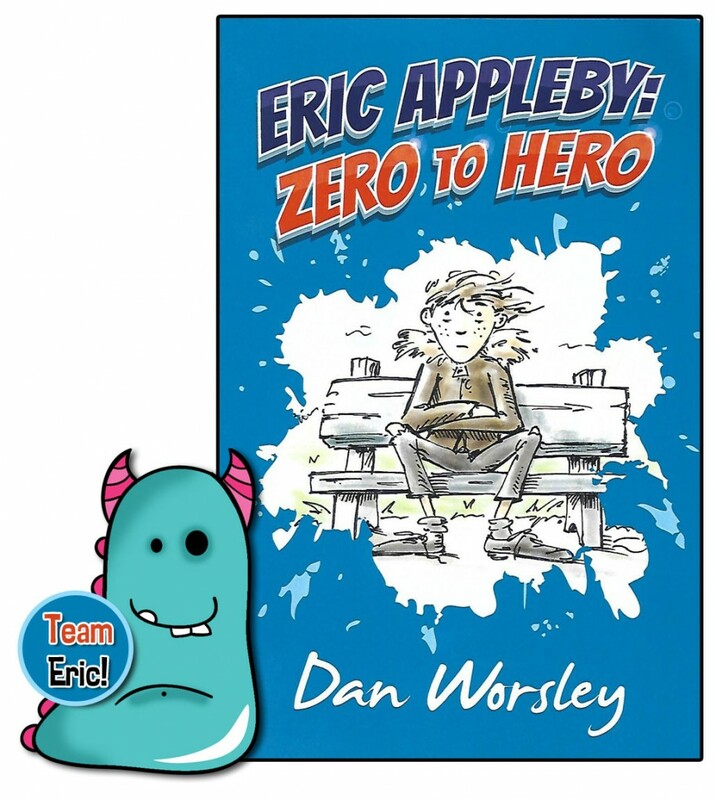 Eric Appleby struggles to fit in, struggles with his work and generally has little self confidence and finds it hard to fit into school life. This is his story. Without saying too much here, the tale begins with the sacking of the school cleaners by the seemingly nasty, but more likely misguided head teacher. Next enters the real villain of the piece, a creepy untrustworthy character who raises suspicion immediately. Not long after, the whole school and its pupils are plunged into a frightening situation. Well, all the pupils but one of course. As in life, Eric manages to keep on the fringes of what’s happening, and so it’s down to him and him alone to save the day. Can this shy, under-confident child win through in the end and save the school? I’m not going to tell you that, obviously!! Read it yourself! I really did enjoy the story of Eric Appleby immensely. It’s a shorter story book, which is great for younger readers or reluctant older children. It is very fast paced so grabs your attention straight away, and it is very well written, with great descriptive vocabulary for children to learn from. The characterisation is excellent and Dan has managed to give the reader a strong feel for the characters concisely so that you quickly get the measure of each person. My favourite aspect of Eric Appleby! Zero to Hero though was the inventiveness. Dan wanted to create an action movie within a school environment and he’s really achieved this with huge success. It reminded me of a cross between Home Alone and Die Hard! A killer combination which children will revel in!! Martin Spore’s wonderful illustrations really capture Eric and his life. The cover image of him sitting on the school bench is my favourite and really sets the scene and helps you empathise with Eric very quickly, yet doesn’t give away the true craziness within the pages of the book. There are little illustrative scenes throughout the story to help break up the text, which is great. In fact I wanted more of them! Eric Appleby is not just an action book, it’s a story with real heart. The relationship between Eric and his father is really very lovely to read. And of course to see Eric transform in character and gain in confidence gradually throughout the story is a joy and can only bring a smile. It’s something we would all wish for those shy children to experience. Eric Appleby! Zero to Hero is a real gem of a book that I know will appeal to so many children in my library. Dan and Martin have done a wonderful job creating this and ensuring it’s as good as it can be, and it really is. I’m genuinely looking forward to getting to know Eric better in future books (which I believe there are plans for), maybe with even more of those wonderful illustrations and some new characters thrown in! Thank you for munching on the first Book Monster review of 2016. Previous Post Book Monster’s Best Bites of 2015!